The fee payment may be divided into three equal payments ( see application for payment schedule and method). This program consists of on-line study containing five 5hr. on-line learning modules exclusively written for this YTT (excluding the Anatomy & Physiology 101 module). Module One is a prerequisite for Module Two. Module Two is a prerequisite for Module Three and so on until all modules are complete. Anatomy category is completed on-line via Universal Class. The Anatomy portion may be used as a University credit. The practicum occurs every weekend for seven weekends. There are no classes over March break weekend. The last weekend of the program is dedicated practicum testing and final exam. This 200 Hour YTT is registering eight students only. Space is limited so don't wait to register! 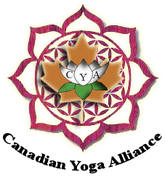 Teaching Methodology Asanas, Pranayama & Meditation (125 hours)(see dates above), Ethics & the Yoga Lifestyle and The Business of Yoga (15 hours) (March 31 & April 1). All hand-outs & book list will be given before the program commences and all books are the responsibility of the enrolled students. We advise that students bring their own yoga mats; however, mats may be provided upon request.